Aroma Acupoint Therapy or AAT is a gentle, completely safe and profoundly effective treatment modality that utilizes the energetic treatment potential of pure essential oils and acupoints combined. Treatment involves placing particular oils on specific acupuncture points on the body in order to trigger energetic changes in the individual that will bring the client back to a state of balance. Aroma Acupoint Therapy works on the basis of mutual resonance through the systematic and intentional combination of essential oils and acupuncture points, resulting in a more significant clinical effect than using either of these alone. The basic premise is that essential oils, being energetically just as active as acupuncture points, have the ability to stimulate points in a similar way as needles. However, the difference between them lies in the fact that, unlike acupuncture needles, essential oils are also able to provide information to a point in addition to mechanical and energetic stimulation. By stimulating and giving the point information at the same time, essential oils will ultimately achieve a greater therapeutic effect. The basic aim in treatment is always to select an oil that possesses the same function as an acupoint; an oil that will activate a particular point function. Geranium oil (Pelargonim x asperum), for instance, is a female hormonal regulator in women with reproductive weakness and therefore a perfect match for points such as SP-6 and CV-4, as these points posess the same function. However, Geranium is also a mucostatic remedy that can help reduce vaginal discharges, and as such is appropriate for application onto other points such as CV-6 and SP-10 in women with a damp or congestive condition of the pelvis. Conversely, because each acupoint has more than one function, there are several oils that could potentially be used with it, based on the treatment required. An important acupoint such as CV-17 at the center of the chest can be oiled with a nervous sedative oil such as Marjoram (Origanum maiorana) or Helichrysum (Helichrysum angustifolium), as this point has a good calming effect on the whole system. This combination may be used in states of acute anxiety and agitation, especially when there is an emotional component present. Equally however, CV-17 can be oiled with respiratory restoratives and stimulants such as Siberian fir (Abies sibirica) and Black spruce (Picea mariana) to enhance the point’s excellent tonifying and strengthening effect on the lungs and bronchi. This type of combination is highly beneficial, for instance, in individuals with constitutional lung weakness, in chronic respiratory infections or to provide support in states of grief; these are all conditions where lung energy is weakened and will benefit from this powerful oil-point synergy. In all these cases, the essential oil is able to effectively and safely engage and amplify a particular acupoint function, ultimately achieving a greater effect that will involve the whole individual, physically, mentally, emotionally and spiritually. The mechanism of action at work here is unproven, as Aroma Acupoint Therapy is a very new treatment modality. Still, there are several theories that would help explain the bodymind’s often immediate response to oil-point treatment, as well as the long-term effectiveness of this therapy. One theory is that the oils are able to activate peptides connected with the points that, through the meridian energy pathways, transmit the suggested action to specific target tissues, organs, and so on. The simplest explanation, however, is the universal principle of reciprocal resonance. Oils and points possessing a similar quality and function will energetically resonate with each other and so create a particular sonic vibration or frequency. This would be the same as the sound frequency created when a peptide docks into a receptor site. This is essentially how a therapeutic effect is achieved. The basic framework for the use of essential oils in Aroma Acupoint Therapy is a clinical, empirical model of the energetic properties of essential oils. It was developed by Peter Holmes in the early 1990s and is based on the sensory fragrance qualities of essential oils – it has been called the 'psychosensory' approach. The oils are broadly divided into high, middle and base tones, corresponding to their rising, circulating and sinking energetic movements, respectively. Within these lie the specific categories of their fragrance qualities, such as Fresh-Pungent-Fresh, Spicy-Pungent, Sweet-Green, Sweet-Woody, Green-Lemony, and so on. Rosemary oil (Rosmarinus officinalis), for instance, is a Fresh-Pungent oil with secondary Sweet and Green qualities. Every fragrance category has specific energetic and functional properties that all oils belonging to it have in common. So Fresh-Pungent oils are generally stimulating, energizing, uplifting, awakening and warming. They are used in weak, cold and damp conditions with their typical symptoms of fatigue, cold extremities, etc. Roman camomile (Anthemis nobilis), for another example, belongs to the Green-Sweet oil category and is usually chosen for its cooling, relaxing, pain-relieving and centering effects that are typical of this category. Within an oil’s group function then lies its own separate functions, which span specific physiological actions, psychological functions through to spiritual functions. Any of these may be engaged during treatment. Aroma Acupoint treatment consists of just one drop of an essential oil being lightly applied to the acupoint with a finger or cotton swab and held in place for a short amount of time. The practitioner will select one or more treatment sequences or patterns that typically involve activating between three and eight points. In the context of bodywork, this may be followed and/or introduced by massage, deep tissue work, etc. In the context of acupuncture, this may be optionally followed by needling other points. Although Aroma Acupoint Therapy lends itself beautifully to being used alongside these other types of treatment, it does not rely on these for its effectiveness and successfully stands alone as a method of treatment. 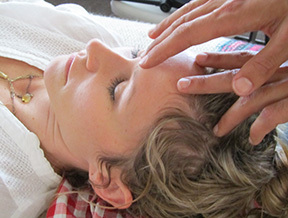 The practitioner will choose to perform one or more treatment sequence per session. These are named after the most prominent symptom in the syndrome, e.g. Racing Mind, Neck and Shoulder Tension, PMS with Heat, Emotional Withdrawal, and so on. They are organized according to an underlying syndrome of energetic or functional imbalance. The treatment sequences are specific to modern-day patients, their health concerns and their frank disorders. They are based on what we actually see in the Western clinic day in and day out. Once the practitioner gains greater experience and comfort levels with the treatment sequences, she will know when to modify a sequence to give a more individualized, client-tailored treatment. On the basis of increased knowledge of the oils on one hand and the acupoints on the other, she may select other point-oil combinations appropriate for a particular client. Evaluating the symptoms the client presents is performed using the Six Condition diagnostic assessment, a user-friendly diagnostic system that Peter again developed over many years of practice and research into the diagnostic systems of traditional Chinese, Greek and Ayurvedic medicine – the three extant world systems of energetic medicine. The symptoms may be mental, emotional or purely physical, and form syndromes of energetic imbalance. The main axis of imbalance seen in our society is the axis of Tension/Weakness, which is based on hyper- and hypo- functioning of the nervous system, respectively. Commonly seen as well, however, are symptoms of imbalance on the Hot-Cold axis, based on hyper- and hypo- functioning of the body’s warmth-circulatory system; and the Dry-Damp axis, based on tissue hydration and fluid balance. The symptom evaluation itself includes not only what the client reports but also an assessment of the facial complexion, skin quality, muscle tone, breathing, voice, pulse quality, physical movement, likes and dislikes as regards food, drink, climate, and so on. Taken together, they tell the practitioner the nature of the imbalance in terms of the Six Conditions and will suggest possible treatment sequences. Once treatment is underway, the practitioner will monitor its effectiveness by looking for positive signs of change in the client’s complexion, their brightness of the eyes, sound of their voice and improvement in the pulse quality, as well as improvement of actual symptoms. By the end of a successful treatment, it is not unusual to find improvement in all of these diagnostic parameters – in some cases very soon after all the oils have been applied. The pulse in particular can respond very quickly to the rebalancing effect of oils applied to a judicious selection of points. This is because the pulse registers the functional changes taking place in the vascular autonomic system. The origins of Aroma Acupoint Therapy go back to Peter’s acupuncture practice in the 1980s when he became involved with aromatherapy as it developed in England at that time. Realizing that essential oils were just as electromagnetically powerful as acupuncture needles, he began experimenting on patients by placing a drop of oil on a point instead of stimulating it with a needle. Many years of experimentation and observation then led Peter to develop the experiential model of fragrance energetics for the essential oils. It was first presented at the international Aroma '95 conference in England. Since the early 1990s this model has been Peter's foundation for understanding the inner or energetic nature of essential oils and their effects on body, mind and soul. It is the cornerstone today of the energetic approach to using the oils in Aroma Acupoint Therapy. 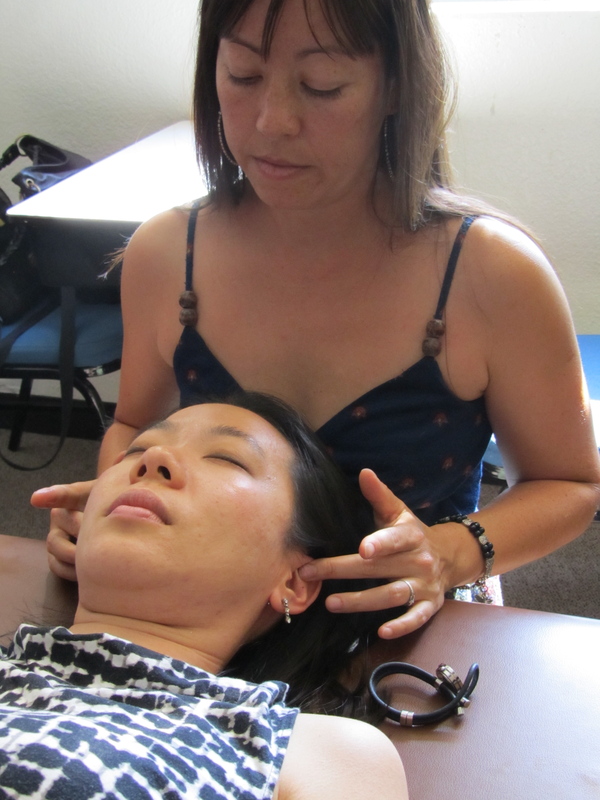 In 2010, Peter began developing the present format of Aroma Acupoint Therapy with the collaboration of Tiffany Pollard, a practicing acupuncturist and massage therapist. Tiffany’s multi-practitioner clinic in Seattle allowed for the use of the oils on a large scale with up to 75 patients a week and generated a further pool of clinical experience with the oils. This collaboration eventually led to the creation of the first Aroma Acupoint Therapy workshop in September of 2011.